It is corn season, and many of our vendors will be selling it at the market! While there is nothing better than having corn on the cob, here is an idea to spice up the way you eat corn! 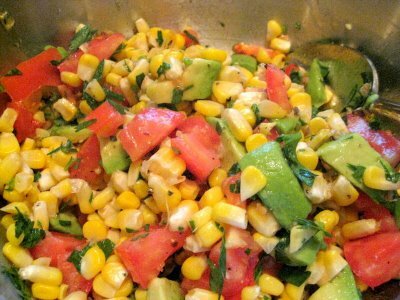 Combine the corn, avocado and tomato in a bowl. Whisk together the olive oil, lemon or lime juice, cilantro, salt and black pepper, and add to the corn mixture. This refreshing salad is great on its own, or with rice, quinoa or pasta. This entry was posted in Corn, Recipes, Tomato and tagged Avocado, Corn, Tomato. Bookmark the permalink. ← Who and what is at the market on August 15th?